New Delhi: A fire broke out on the ground floor of the AIIMS Trauma Centre near the operation theatre area here Sunday, triggering panic among people, including patients. No casualty has been reported in the incident, AIIMS authorities said. A personnel from the fire unit of the hospital suffered carbon monoxide poisoning. He was incubated and shifted to main AIIMS, where his condition remains stable, a source said. A call was received at 6.13 pm about the incident and 24 fire tenders were immediately rushed to the spot, the Delhi Fire Service said. The fire was brought under control by 8 pm and the cooling process is underway, Chief Fire officer Atul Garg said. AIIMS administration has instituted an inquiry into the matter to identify the cause of the fire, which is suspected to be due to a short circuit. “At the nick of time, the alert staff and doctors quickly shifted them to the emergency area,” the source said. Around 50 patients from different floors of the AIIMS Jai Prakash Narayan Apex Trauma Center’s wing ‘A’, which is located above the operation area, were evacuated due to a large amount of smoke emanating from these floors and were shifted to other wards, he said. The electricity supply was also stopped in the building at that time, he added. The hospital source said there was also a leakage in the oxygen supply pipe behind the manifold due to which the oxygen supply to the building was stopped for some time, which was later repaired and restored. The AIIMS, in a statement, said at around 5:45 pm the smoke was noticed in one of the stores adjacent to the OT on the ground floor, staff and doctors of the hospital showed alertness and took quick action to try and douse the fire, while alerting the hospital’s fire safety team and fire brigade, which immediately responded to the call. “As an abundant measure of precaution, the doctors and staff shifted the patients from the vicinity of the area to a safe zone. 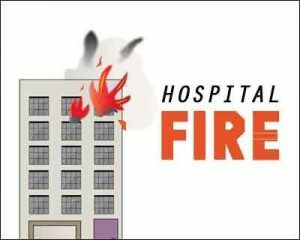 The situation was brought under control and the fire was doused by joint efforts of the fire brigade, fire safety team and staff of the AIIMS,” the hospital said in the statement. The fire safety measure had automatically kicked into action. No patients or their attendants were in any way harmed or injured due to the incident. There has been no injury to the staff as well, it said. The extent of the damage is not yet known and will be accessed later, the statement said. Another source said the linen OTs clothes and cotton kept in the store were burnt, which led to a huge amount of smoke. Police from the southwest district were also called in to control the crowd which had gathered in the hospital vicinity, while the traffic movement on the road in front of the AIIMS Trauma Centre was disrupted for a while, a police official said.